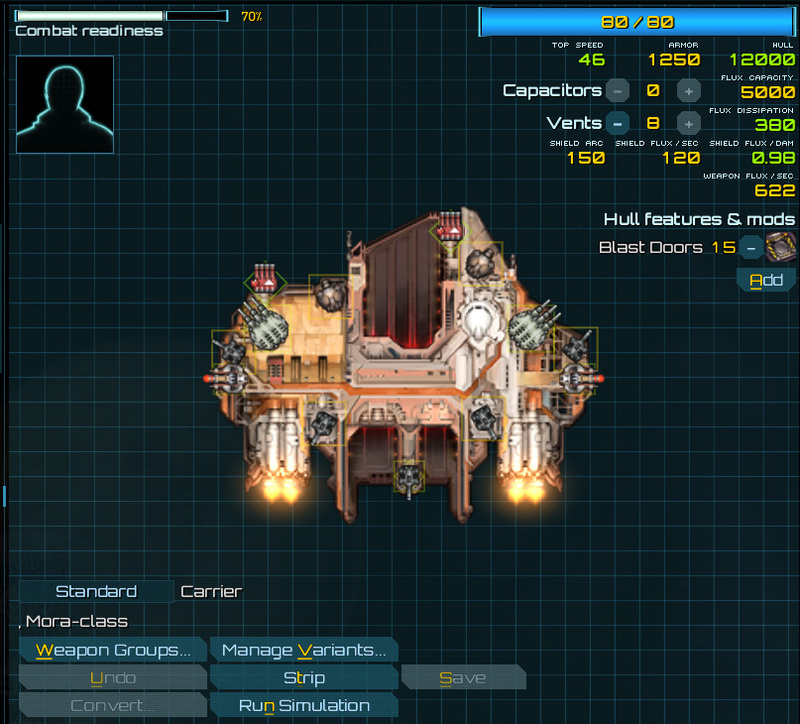 There’s no large low-tech carrier in Starsector; today we create one! D: Ooh, I’ve got this: So given that Hegemony doctrine inherits the ‘traditional’ doctrine of the Domain at the time of collapse – of heavy line battleships, though at the start of a transition back to cruiser/carrier doctrine – this specialized lowtech cruiser carrier could be a holdover from the previous wave of Domain doctrine that had a larger role for fighters. So why are these in the field? The Domain navy decommissioned them from military service, so they were de-militarized and sold to budget-minded civilian enterprises in development on the Domain’s frontier, as having some former carriers with big handling/construction bays can be a very useful thing. Once the Collapse comes around, these former construction/mine drone handlers slash ersatz mobile drydocks are re-militarized (thus less useful out-of-combat stats than one might expect). Used perhaps more by pirates, independents, and the Luddic Church more than by the Hegemony or TriTachyon, so that the big carrier fleets of these guys can be supported by something better than Condors but not so good as the Heron or Gemini. 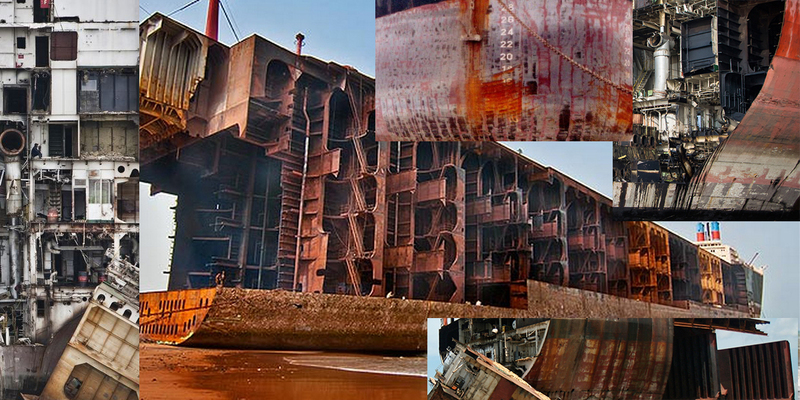 Decommissioned then recommissioned ships reminds me of shipbreaking, of which many dramatic images can be easily found. I pulled a few together for palette & aesthetic reference. 1. Don’t just take your colours straight from the default palette. Prove that you thought about the colours you’re using by going through the process of choosing them for a reason, not just because they were there. Back when I did IRL painting, it would annoy me when I could tell that a painter had used paint straight from a tube. It’s not that it necessarily indicates lack of rigour, but… yeah, it usually indicates a lack of rigour. 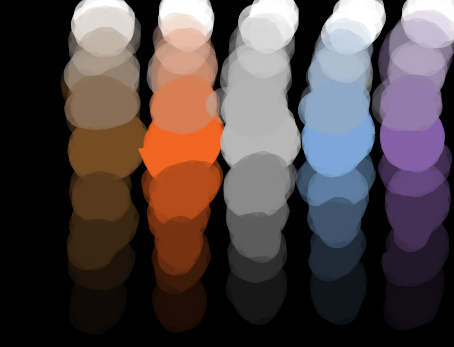 I took default Photoshop palette brown, orange, light gray, blue, and pale purple and did a simple ramp to white and black. This is rather like when they teach you how to mix paint in elementary school. Take your red, add white to make it lighter. Take your red, add black to make it darker. Sure, these are important fundamentals to start from, but it’s so boring! Why can’t orange fade to a saturated green? Isn’t that more interesting? I used to think I should work with colours in terms of how a computer might render an image: Everything has an ideal ‘true’ colour, so that would be the base. Trees are green, the sky is blue, clouds are white. Then maybe if I’m feeling fancy I could shade it a bit later. Touch of orange overtop for a sunset, whatever. Sure, and trees are scribbly puffs on top of sticks, houses are boxes with triangle roofs, an eye is an ellipse with a circle in it. But no, all of this is pushing an idea of the image formed from a sort of enculturated default. The observable world will provide countless counter-examples to these platonic forms of shape and colour- why, I’ve got a tree outside my house right now which has dark reddish-purple leaves (of all things) rather than green. But walking by, the plum tree looks like the most natural thing in the world. As with form, as with colour. You must let go of your feelings and trust your eyes; Trust the targeting computer that takes in what is really before you. Colour is messy and contextually subjective, it is far more important how one patch of colour looks compared to the colours around it than it does in the default palette, or in the colour-picker. What matters is the impression it creates in the context of its presentation. 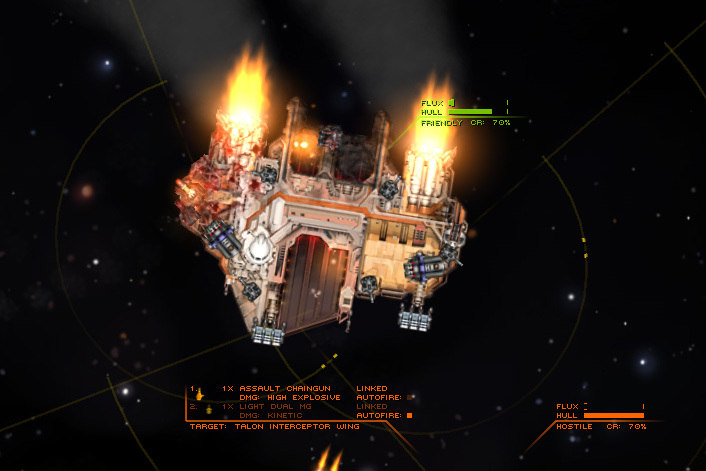 In our case, that is in Starsector, while playing the game: that is what is seen and that’s where it has to hold together. So, we green? Don’t use boring colours? (Super green.) Let’s get back to spaceships. Got my sampled colours on the left, got my sketch on the right. This is the first image I saved out but you can see I’ve already started chopping it up and moving pieces around. I really liked the look of those hollow boxy compartments with those angled corner/edges in the reference images, so you’re getting those. The working surfaces where fighters will be landing on this thing get more of the worn rusty-purples and pinks while I’m treating the orange as exterior paint and the white/cream as crew and engine modules, presumably less wear and tear and maybe a bit better maintained. So I’ve got (literally) the broad strokes going in fairly happily here, but I hate the silhouette. I’m determined not to draw another brick (like last time), so this bears some thought. Started refining the image. 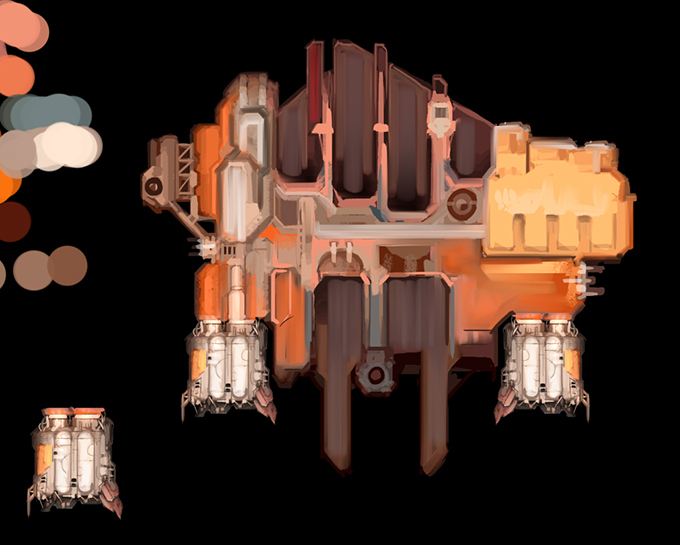 Painted a detailed engine pod thing because I love engine pod things. 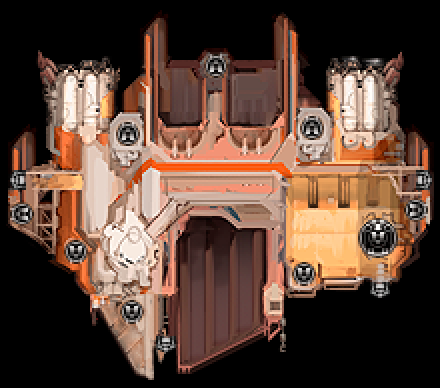 Started thinking about where landing bays go, and where turrets will be placed. The yellow block on the right turned into the maintenance/construction bay while the conning tower/crew compartments are on the left. This is asymmetric of course but it’s important nonetheless to balance the feeling of weight between the sides. 1. Pulled the engine pods more into the body of the ship for a more coherent hull. Flipped them around so the mini armour plate wings coming off the engines were on the outside rather than inside. Had the thought that they’d protect fighters from engine burn, but it looked a bit funny (and we’ve got the trailing struts for that now anyway). 2.Made trailing elements more prominent, added definition to central hull mass. 3. Shortened rear landing bays to give the center more mass. Removed one of the front landing bays to pull ship together better & increase ratio of construction hold to landing bays. 4. Experimenting with flipping the angle on the front landing bays, adding more mass to crew/conning sections. 5. Decided no, flip that landing bay back around and make it one big bay so it reads clearly at a distance. The previous iterations of this ship had features that all operated on around the same slightly-too-small scale; proper ships need forms that resonate on all scales; zoomed-in, center of action, as well as at great distance. 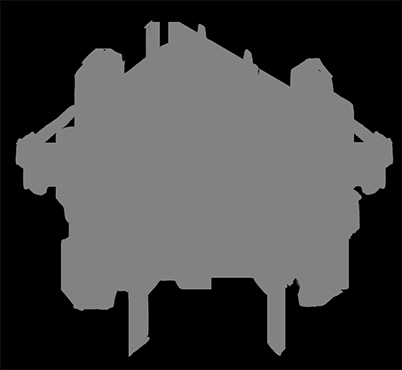 Added an angled hull piece to echo the Eagle/Falcon/Onslaught core Domain line of warships, plus the classic rounded con which nicely contrasts with the angled blockiness elsewhere. More turrets. Because so much of the rendering has been done in the “sketch”/painting phase I can just take the sketch and scale it down. Ah, but to what? Let’s pull up the giant image with every ship in the game and drop our image overtop to scale it according to its ship class. Somewhere between the Eagle and Dominator looks about right. Now run a sharpen pass to harden up those details and let’s pull up some ships that seem to be in the range of what this carrier should feel like. Let’s say: Dominator, Venture, Wayfarer, Mule. They’re all a bit more yellow, aren’t they? Well, I’ll worry about a final colour adjustment pass at the very end when I do shading curves and the like. I fully expect that you, dear reader, will come up with a suitably broken build for our cruiser-carrier here. It’s important to change your perspective. While drawing I’ve been flipping this 90 degrees every 15 minutes or so. Let’s me see if I’ve thrown the balance out of whack, and just gives a fresh look overall. (For the sake of this blog post I’ll stop rotating the poor thing, however.) Touched up the crew-side armoured half-wedge. Note all the colour variation in it, like corroded metal, or a heavily worn paint job. Started cleaning up bits of hull, the landing bays. The bridge received definition (and a nice fresh coat of white paint). I think I’m trying for a cleaner bridge window style than the noisy mess you see on ie. the Dominator. Let’s jump into some drawing techniques. Here I’m cleaning up the geometry on the trailing struts. I’ve gone in with the polygonal lasso tool to define my edges. 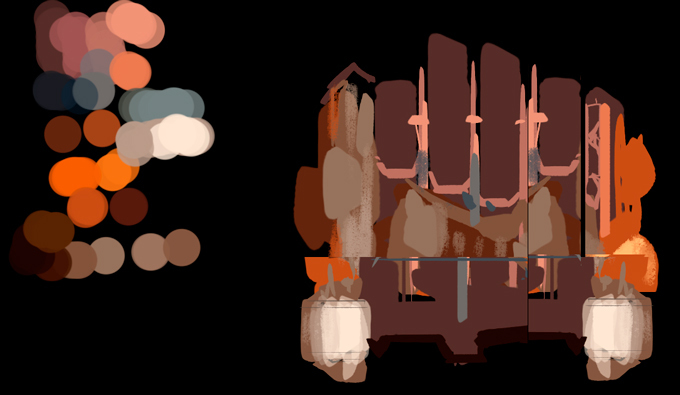 I’ll delete the selected area, then invert selection, and do some painting with an airbrush to do gradients, rough up the texture with a rough brush, then touch up lines and details with a pixel brush. 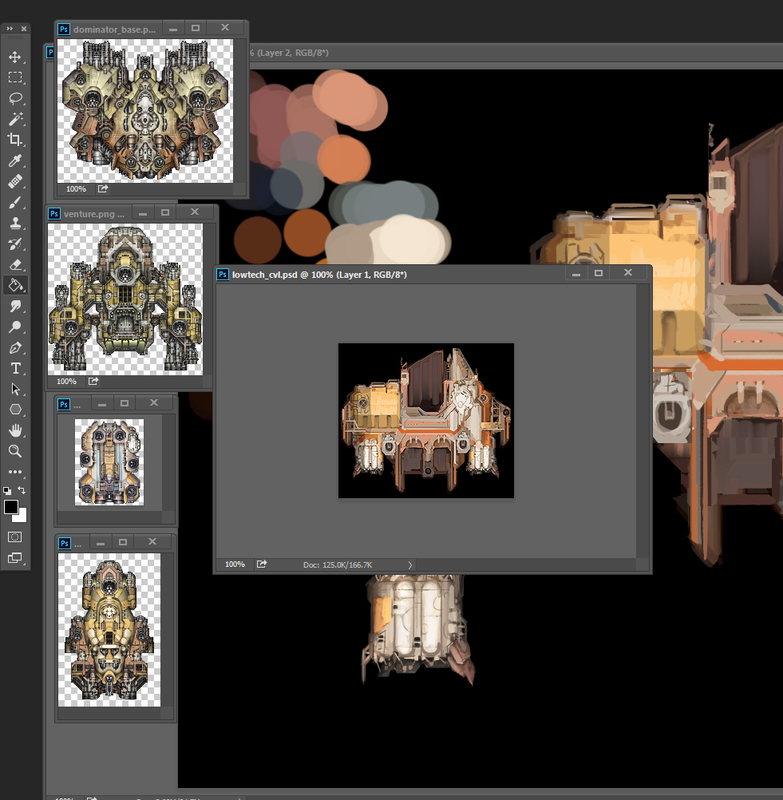 The pixel brush is only for the edges and details though, most of the lifting at this stage is done with larger more painterly brushes in combination with masks/selections. This lets me accomplish both sharp detail and sweeping painterly strokes & texture in the same image. What’s that, you want to hear more about painterly technique? Of course you! The beginner pixel artist starts by drawing outlines and filling them in, method 1. (Also generally true of artists in general – most start by drawing lines to form images; or, really, learned icons that reference physical objects, see: earlier ramblings about trees and houses.) This is a good and useful technique, but there is more to the world of drawing! Here are two shapes of different value – and hue, even, to mix it up – which be distinguished by their contrast. You don’t need to outline anything at all to distinguish shapes! I’m pretty sure this is the fundamental difference between “drawing” and “painting” if you really get down to it. This is a slightly more refined version of 2, we’ve pushed the contrast further on the edges; darker on the left, lighter on a right, so that the shapes are even more differentiated. 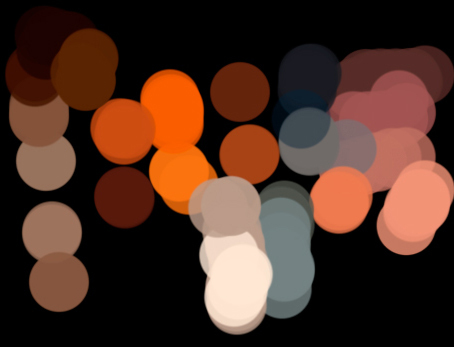 Curveball: I just used a lighter rather than darker coloured line to distinguish shapes. In a way, this makes the edge and associated shape push out like a ridge rather than in like a cut. How about using linework of both darks and lights? Example 6 does not exist. But, homework for the reader: try combining all of the techniques described. There’s lots of cool possibilities here for rendering forms. Point is, there’s a lot more to your toolbox than dark outlines. Combine all these techniques in a manner that best serves your aesthetic goals. Draw AND paint! At some point in here we agreed upon the name “Mora”, from the Spartan military unit. The thought is that this ship will be the versatile fighting heart of a fighter swarm; a formation fighter, bristling with spears or possibly small pointy guns. Not so unlike a phalanx or legion (which were also names considered). 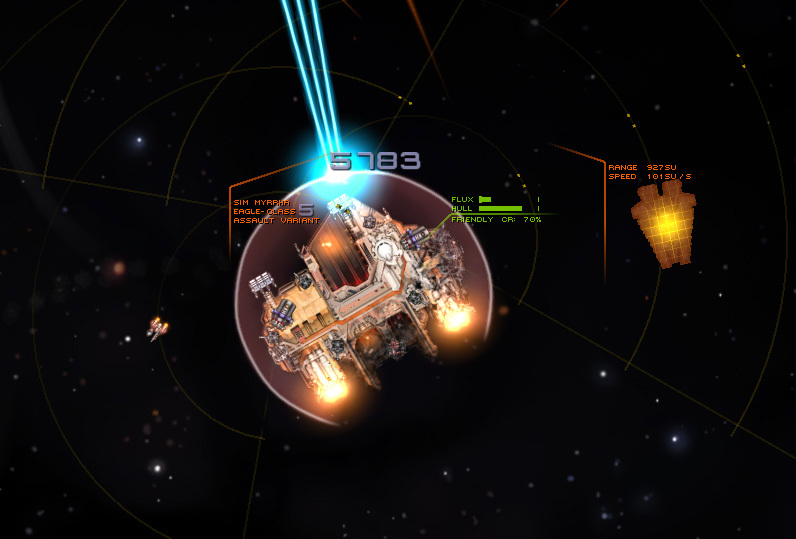 There was also some discussion of weapon loadouts and special systems — the thinking is that a burn drive would be somewhat abuseable and make for annoying kiting, so why not use the Centurion’s damper field? 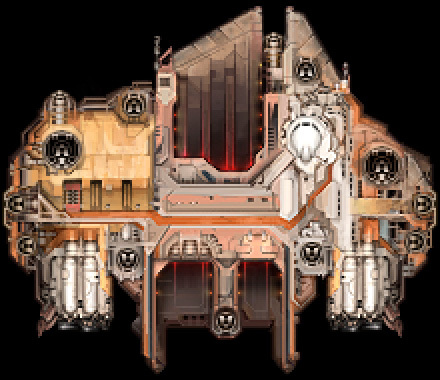 It plays a bit against type, turns this carrier into something of a tank, but that should be interesting because the goal of the Mora is the have a tough, versatile ship that can be outfitted to play several different roles, from close support to missile boat to tank to (fine!) kiting. Moved to a blue background so I can better see the transparent bits and appreciate the shading. Otherwise finessing details, integrating generic turret mounts into the sprite. Details, details. And here I’ve shaded the launch bays and given them a bit of glow. About that! It’s fantastic stuff. Check out http://www.gibhard.com/ or his twitter feed; very inspirational. 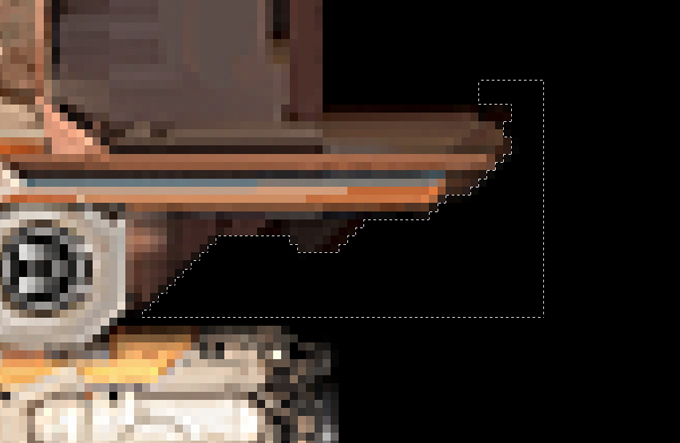 Even if it is a much more formalistic approach to pixel art than I generally use, there are just points in there that make me go “I want to do that too!”. Right, so I think that knocked the thought loose from my skull to take what I think now is a more interesting approach to rendering the glow in those launch bays as compared to earlier carrier sprites. Now we’re back to a black background so I can get a better feel for the overall shading. 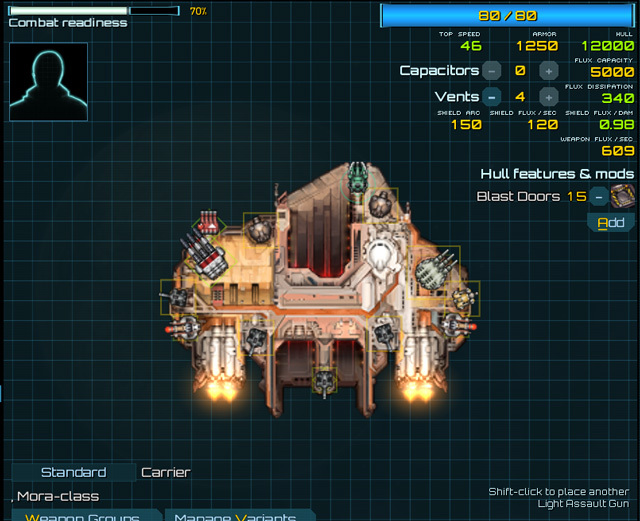 More little point lights, plus added lots of ports to the habitation part of the ship. I figure black windows rather than glowing works better on the white plus it provides a contrast with the launch bay lights. 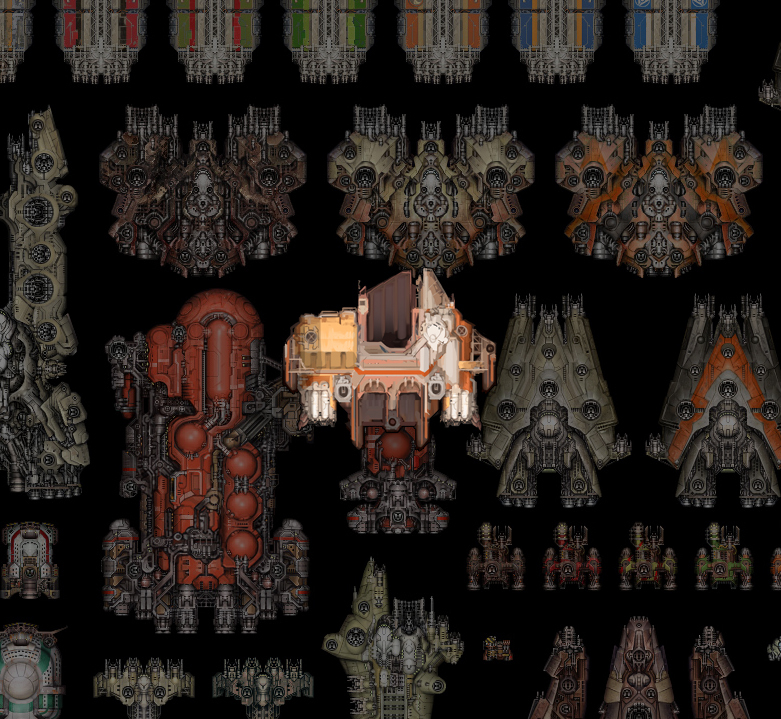 And here, with some hue/saturation and curves adjustments to bring it more in line with existing ship art, I declare it “done”. Done is not of course done done, but it’s time to put this in-game and fly around causing trouble. Let’s take this for a proving run! A few things jump out immediately: the arc on the right-side medium slot kinda runs into the conning tower, the left-side sabot rack there is almost floating out in space. Just need to clean it up – there. This entry was posted on Sunday, May 15th, 2016 at 7:32 pm	and is filed under Art, Development. You can follow any responses to this entry through the RSS 2.0 feed. Both comments and pings are currently closed.